I am going through some old scanned photos and came across this shot I took quite a few years ago in Guyana. The objective was, to get as far away from the beat-and-track as possible, and meet people out of touch with the rest of the world. So we traveled a day into the interior of Guyana until the roads ended, and then got a fast boat up river for another day. 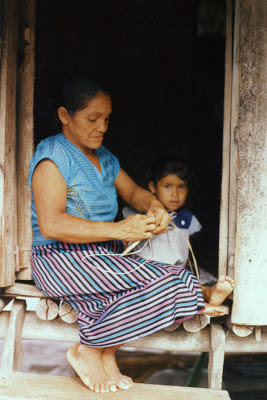 Eventually we arrived at a small village “cut off” from the rest of the world where people hardly ever experience outsiders, and where they live in the rain forest just like they have done for thousands of years. In that village, I met this lady, and we talked about life and the world. “Where in Canada?” she probed. Hmmm, small world! Clearly I did not have to go so far to find people who were out of touch; I just needed to take a look at myself.